●When storing a bottle, close the cap. ●The bottle may not be stored depending on its size or shape. 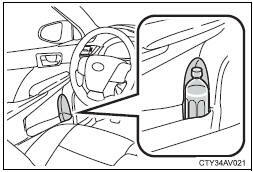 ■Items unsuitable for the bottle holder Do not place anything other than a bottle in the bottle holders. 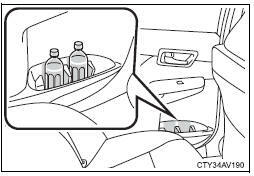 ■Items that should not be stowed in the bottle holders Put the cap on before stowing a bottle. Do not place open bottles in the bottle holders, or glasses and paper cups containing liquid. The contents may spill and glasses may break.